You’ve had a bad year. You got demoted and dumped. You’re tired of felling used and abused. You don’t give a crap about what anyone else thinks anymore. Well payback’s a b… ad roommate. You want to scare everyone you encounter, and scare them badly. Severe fright to women, children and the generally jumpy? You bet. Costumes don’t come much scarier than this Devil Skull Mask. Razor sharp teeth, horns, terrifying skull. Check, check, check. It’ll feel good to make someone else scream for once. Oh, yeah. As all studious Dungeons & Dragons players know, Devils are the lawful evil denizens of the Nine Hells, not to be confused with Demons, the chaotic evil inhabitants of the Abyss with whom they’re locked in an eternal war over the Lower Plains. That means devils like to follow rules while they carry out their evil deeds, while demons don’t want to put up with any red tape. Common knowledge, really. So get up to some well-organized, lawful evil mischief this Halloween in this Devil Skull Mask. This devil has gotten a wee bit tired of just eating souls. So now he eats souls and human flesh. Notice his new shark teeth? Perfect for ripping people to shreds. 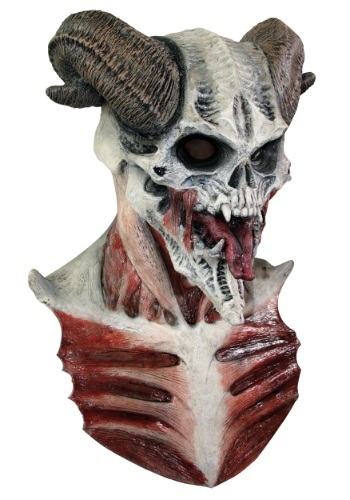 Scare the Beelzebub out of anyone you meet when you wear this Devil Skull Mask. It’s a full mask with a long front bib so you can go for a suave, open-chested devil look and still be completely covered.